Shoulder anatomy is actually four joints wrapped up in one arm. Shoulder anatomy is made up primarily of bones, muscles, ligaments, nerves and blood vessels. The arm bone (humerus), the shoulder blade (scapular), the collar bone (clavicle), and the rib cage (bony thorax) make up the relevant bones. Note particularly the ACROMION (part of the shoulder blade) and the ACROMIOCLAVICULAR joint (AC joint). 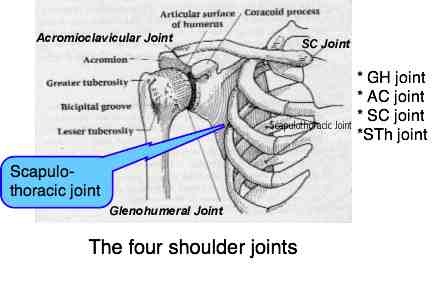 The Gleno-Humeral joint (GH). 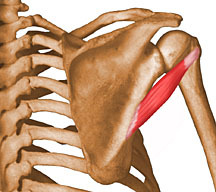 The main shoulder joint where the arm joins the shoulder blade. The Acromio-Clavicular joint (AC). The joint between the collar bone and the shoulder blade. The Sterno-Clavicular joint (SC). The joint between the collar bone and the breast bone. The Scapulo-Thoracic joint (STh). 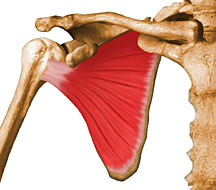 A muscular joint between the shoulder blade and the rib cage. 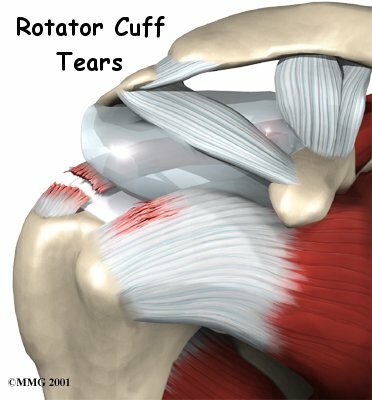 There are FOUR rotator cuff muscles to which we add a fifth for convenience because it's often involved. SUPRA-spinatus muscle. It lies above the spine of the scapula and is involved in raising the arm. INFRA-spinatus muscle. 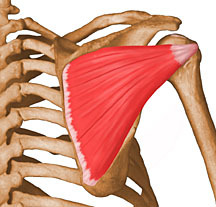 This muscle lies below the spine of the scapula, hence infra. It's involved in external rotation such as in winding down a car window. SUB-scapularis muscle. This muscle lies under the shoulder blade and is an internal rotator. Teres Minor muscle. Another external rotator. The extra muscle: Biceps is really two muscles. Hence "bi". 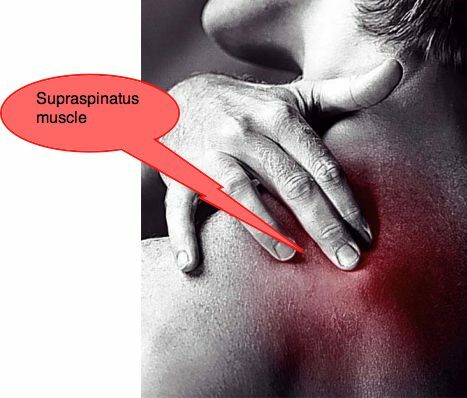 This important muscle lies just below the neck, and just above the so-called "spine of the shoulder blade". You may find yourself rubbing it frequently as it may feel as though the pain is in the upper back. It travels through a tunnel in the shoulder and inserts into the upper arm. It is the primary lifter of the arm at 45 degrees with the thumb pointing down. This large muscle is found "infra" or below the spine of the shoulder blade, and also inserts into the shoulder. It rotates the arm outwards. 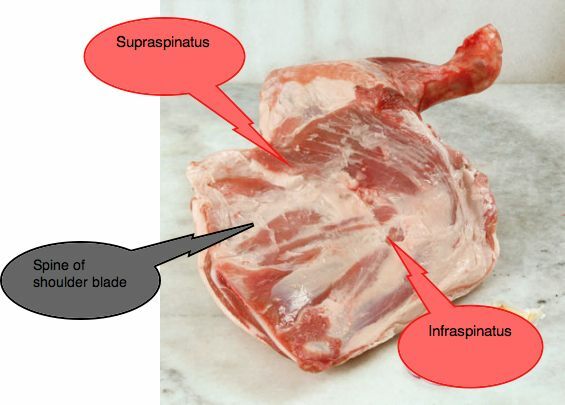 Next time you carve the Sunday roast lamb shoulder, look out for the spine of the shoulder blade, with the Supraspinatus above it, and the large flat muscle, the Infraspinatus below it. The shoulder blade, seen below side-on, or what we call the lateral view. It is an important bone for the both the attachment of the arm - the head of the humerus fits in the 'glenoid fossa' - and for many shoulder muscles. It's the long head that gives grief due to the long journey of its tendon through a groove in the humerus to its attachment just above the glenoid fossa (where the humerus sits). It ruptures sometimes, particularly in older men suddenly taking on a frenzy of heavy work such as shovelling snow. Also after cortisone injections. See the two heads of the BI-ceps muscle? See if you can follow that long tendon of the biceps up to its origin at the Supraglenoid tubercle. If flexes the forearm, and rotates it into what we call supination. Outwards. If you prod with your thumb into your armpit, you'll feel the edge of the scapula, and between the scapula and the ribs is where you can feel the Subscapularis muscle - the very devil when it comes to a frozen shoulder. This large flat muscle lies on the underside of the shoulder blade, between the scapula and the ribs. Opposite side to the Infraspinatus. It attaches to the arm at the Lesser Tuberosity (LT in the scan below). Have a good look for it too when carving the Sunday roast! 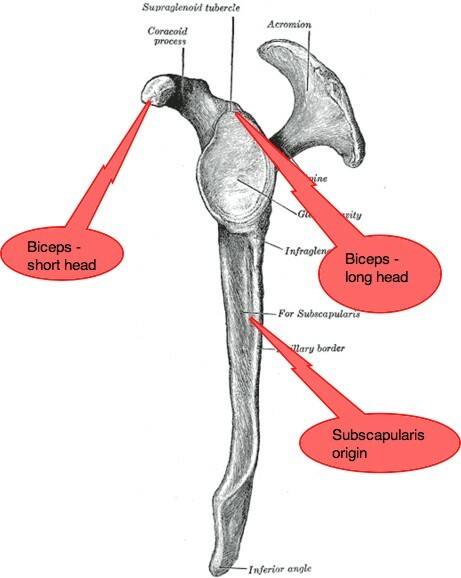 The Subscapularis rotates the arm inwards. 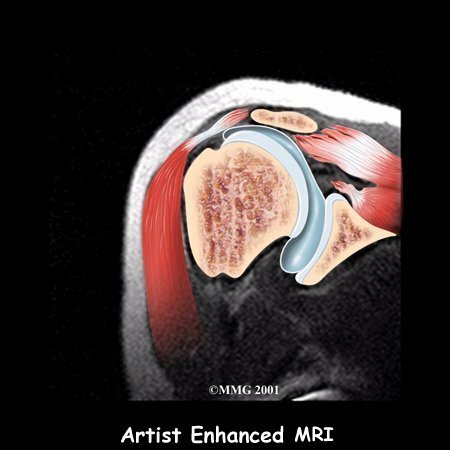 In the author's experience the SUBSCAPULARIS MUSCLE (SSC in the scan below) is a much neglected muscle in shoulder anatomy conditions. It is best approached in the armpit with the arm flexed above the head. If it is involved, it may be exquisitely painful on palpation. For interesting cases of shoulder pain (and other) at the Chiropractic Coalface, click here. Chiropractic Coalface ..
After serious soft tissue injury, a Doppler ultrasound scan often yields information that cannot be obtained from the clinical examination alone. 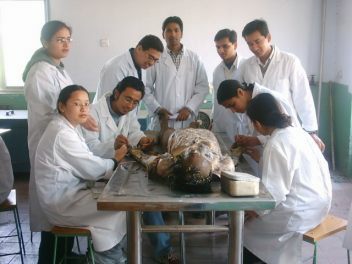 It does however require specialised interpretation, and is best left to the specialist. 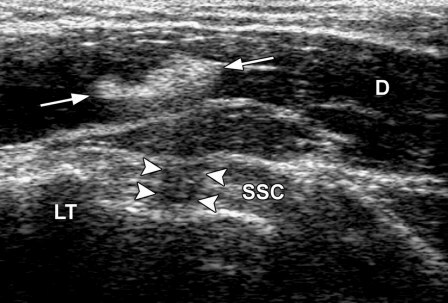 This scan of the subscapular tendon (SSC) shows scar tissue (arrows) in the deltoid muscle (D). However that scar tissue can produce a confusing shadow (arrowheads) that mimics a tear. Regular stretching in the healing phase is what prevents the ugly scar tissue in muscles that can turn a relatively minor shoulder anatomy injury into a frozen shoulder. 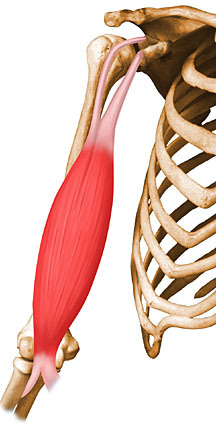 Strains and tears can occur in all muscles in the body; the teres minor muscle is often affected. Injury eg. a fall especially on the outstretched arm. Disturbed nerve innervation of the muscle eg. an irritated nerve in the neck weakens the muscle making it vulnerable to injury. Improper warmup in sport eg. Tennis players who do inadequate prematch preparation. Yes, indeed, grotesque, but an important place where your chiropractor spent many long hours studying shoulder anatomy, preparing him or herself for a lifetime of helping you recover from your injury. 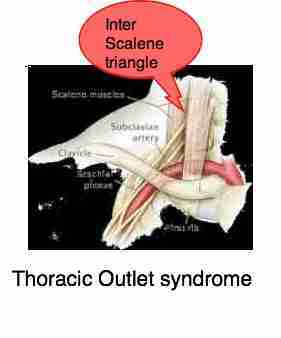 The thoracic outlet syndrome that may commonly irritate the nerves that supply the shoulder affects both the artery and the brachial plexus as they pass through a narrow tunnel from the chest to the arm; the blood supply is via the subclavian artery. 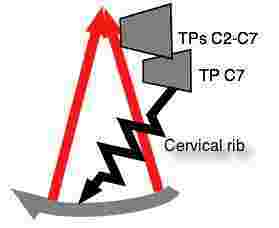 Usually small and inconsequential, very occasionally a large cervical rib at the base of the neck may pass through the interscalene triangle dramatically affecting the artery and nerves. A difficult and subjective examination is commonly used to test for an impingement on the artery in the Thoracic Outlet syndrome and Cervical rib syndromes; Adson's test. Classically the symptom that you may feel is that your arm tires very quickly when working above your head, as in hanging the washing, or changing a light bulb. It's just one more reason incidentally to buy LED light bulbs; they last far longer and use a fraction of the electricity. We'll write elsewhere of the ligaments affecting the shoulder. 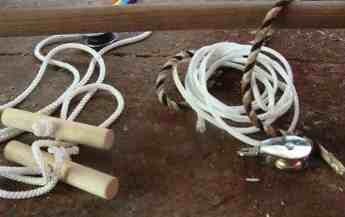 Shoulder arm exerciser ... easy to make.